Last reviewed by Editorial Team on August 24th, 2018. Glutethimide is a hypnotic sedative drug that was first introduced by Ciba in 1954 as a safe alternative drug to barbiturates for treating insomnia. Before long, however, it had become clear that glutethimide was just as likely to cause addiction and caused similarly severe withdrawal symptoms. What are Brand and street names for glutethimide? Glutethimide is categorized as a Schedule II drug under the Convention on Psychotropic Substances. It was originally a Schedule III drug in the US under the Controlled Substances Act, but in 1991 it was upgraded to Schedule II after it was discovered that misuse combined with codeine increased the effect of the codeine and deaths had resulted from the combination. In 1954, glutethimide (Doriden) was introduced into the US market as a safe substitute for barbiturates. Within 1 year, the ﬁrst report of glutethimide poisoning appeared in the medical literature. Subsequent experience with glutethimide indicated that the severity of the abuse potential and withdrawal symptoms were similar to those of barbiturates; chronic abuse of glutethimide resulted in tolerance, dependence, and an abstinence syndrome. During the 1980s, the combination of codeine and glutethimide (“packs ” or “loads”) gained popularity as an aphrodisiac and an oral substitute for heroin. In 1991, glutethimide was given a US Drug Enforcement Administration schedule II classiﬁcation in response to an upsurge in the prevalence of diversion, abuse, and glutethimide – associated fatalities. Today, there is a limited medical use of glutethimide in the United States. The substance became available in the 1950s as an alternative to barbiturates. As a medicine, this drug is mainly used to calm people and make them sleepy. It has also been used to help prevent jaundice in newborns and to reduce muscle tremors in adults. Glutethimide intoxication has been likened to that from alcohol or barbiturates. Glutethimide seems to works as a GABA agonist which helps induced sedation. It also induces CYP 2D6. When taken with codeine, it enables the body to convert higher amounts of the codeine (higher than the average 5 – 10%) to morphine. The general sedative effect also adds to the power of the combination. Absorption. The poor water solubility of glutethimide results in erratic and delayed GI absorption. Following the ingestion of 500 mg glutethimide by healthy volunteers, the peak plasma glutethimide concentrations ranged from about 3-7 mg/L at 1-6 hours after ingestion. Distribution. Glutethimide is highly lipophilic, resulting in relatively high glutethimide concentrations in brain and adipose tissue after ingestion. The apparent volume of distribution is about 2.7 L/kg following therapeutic doses of glutethimide. The initial distribution phase into tissues is relatively rapid with a distribution half-life of about 4 hours, whereas the terminal elimination half-life is longer (i.e., about 12 hours). Glutethimide is approximately 50% protein bound in blood. Metabolism. Glutethimide undergoes extensive metabolism in the liver to both conjugated and unconjugated metabolites that the kidney excretes. Racemic glutethimide undergoes stereoselective metabolism. Hydrolysis of the glutarimide ring of the d-enantiomer forms 4 – hydroxyglutethimide, whereas hydrolysis of the l-enantiomer results in the release of acetaldehyde from α-phenyl glutarimide. Although some glutethimide metabolites demonstrate pharmacologic activity in animals, these metabolites are not deﬁnitely associated with human toxicity. Excretion. The kidney excretes minimal unchanged glutethimide in urine with the vast majority (i.e., 98%) of the glutethimide dose appearing in the urine as conjugated metabolites. The major glutethimide metabolites in the urine are the glucuronic acid conjugates of hydroxy metabolites. The estimated unaided renal clearance of glutethimide is about 0.5-11 mL/min. In therapeutic doses, the elimination half-life of glutethimide is approximately 8-12 hours. The elimination half-life can increase substantially during serious glutethimide poisonings. How long glutethimide stays in the system? The usual adult hypnotic dose of glutethimide is 250 – 500 mg with a range up to 1,500 mg. Mild to moderate toxicity may develop when the glutethimide dose exceeds 3-7 g. The ingestion of glutethimide doses > 10-20 g or 150 – 300 mg/kg are potentially lethal as a result of CNS depression. A variety of factors determine the lethality of a speciﬁc dose, and survival after the ingestion of 42.5 g occurred with intensive treatment. Glutethimide is a CNS depressant similar to phenobarbital, but glutethimide does not possess anticonvulsant properties. 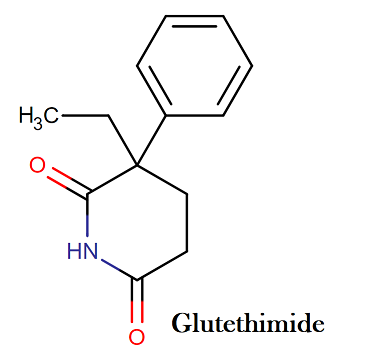 Glutethimide has prominent anticholinergic properties, manifest during glutethimide intoxication by mydriasis, paralytic ileus, and urinary retention. Cardiovascular depression and shock are relatively more common during severe glutethimide intoxication than during similar stages of coma after poisoning by other older sedative -hypnotic drugs. Postmortem examination of patients dying from glutethimide intoxication usually demonstrates nonspeciﬁc ﬁndings including visceral congestion, cerebral edema, and pulmonary edema. A test of the drug’s inﬂuence on mental ability found a little effect, but tobacco smokers seemed to be affected more than nonsmokers. A test of skills related to automobile driving found little inﬂuence from glutethimide. The drug produced inconsistent results in another experiment measuring alertness, reaction time, and decision making. Those tests, however, involve normal doses during relatively brief time spans. Generally, people are advised to become aware of how the drug affects them before attempting to run dangerous machinery. Long-term heavy abuse can reduce mental skills in ways that resemble organic brain damage. Animal experiments suggest that the substance may worsen porphyria, a body chemistry disorder that can make a person violent. The drug can aggravate urinary tract blockage and should be used cautiously by persons with enlarged prostate. Eyesight difﬁculty and dry mouth are among typical unwanted effects. A severe overdose can produce what looks like skin burns, and muscle spasms or even convulsions may occur. Case reports note that long-term use of glutethimide can decrease a person’s calcium levels; one report tells of bones softening in a person who took the drug routinely for 10 years, and another report notes seizures occurring due to low calcium. The drug can also reduce a body’s supply of vitamin D. After a dozen years of daily glutethimide ingestion, one person had lost so much muscle control that speech was difﬁcult, unassisted walking was impossible, and control of urination and bowel movements was no longer possible. Similar case reports exist. Others, however, mention persons who took the drug for years without noticeable ill effect. Exposure to glutethimide is very limited in the United States. The American Association of Poison Control Centers ’ National Poison Data System Annual Report did not list any exposures to glutethimide in 2009. However, before too long it was realized that Glutethimide was extremely addicted to anyone taking the drug, had some severe and unpleasant side effects, caused patients to become dependent on it and is associated with many unpleasant withdrawal symptoms. After this realization, most physicians would not prescribe the drug for insomnia and look to other, safer alternatives. The drug is sometimes used under their brand and generic forms when a patient does not respond to other medications, but it is rare. 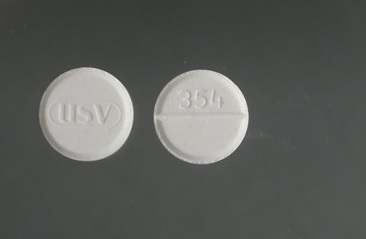 Due to the sedative qualities of Glutethimide, it has been known to be used recreationally when taken with codeine for effects similar to morphine. Some illicit drug users take glutethimide with codeine. The combination supposedly produces a euphoria and stupor like heroin’s. Typical oral doses involved with the abuse of glutethimide are 1 g glutethimide and 240 mg codeine. 4 Desired effects from the use of this combination is the relatively long-lasting effects (i.e., up to 8 hours), the avoidance of the complications of IV drug use, and relatively low cost of the ingredients. However, the combination is highly addictive, and the rapid development of tolerance leads to escalating doses and fatalities. Users of the combination report increased sociability and feelings of intellectual insight in discussions that were actually about nothing. The drug mix can seriously impair breathing, and deaths are veriﬁed. Some of these death involve dosages of each drug that was theoretically safe, outcomes implying that glutethimide and codeine may boost each other’s actions. Users of the combination have experienced typical unwanted actions of both drugs in addition to headaches, grouchiness, tremors, cramps, and trouble sleeping. 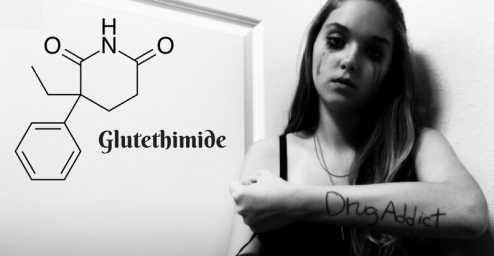 Abrupt withdrawal of glutethimide following chronic use of high doses may produce an abstinence syndrome similar to other sedative-hypnotic drugs (e.g., meprobamate, methaqualone, ethchlorvynol). Clinical features of withdrawal from glutethimide include nausea, vomiting, anxiety, sleep disturbances, and seizures. The clinical features of glutethimide intoxication are similar to other sedative-hypnotic drugs (ethchlorvynol, meprobamate, methaqualone) except the frequent occurrence of ﬂuctuating levels of coma and prominent anticholinergic signs. Serious complications of glutethimide overdose include coma, papilledema, cerebral edema, pulmonary edema, seizures, hypotension, and respiratory arrest. Although respiratory depression is less severe following glutethimide ingestion compared with equivalent doses of barbiturates, hypotension occurs at an earlier stage of coma than a similar stage of barbiturate intoxication. Anticholinergic symptoms are often prominent with mydriasis being the most common sign. Thick, tenacious secretions, ileus, urinary retention, and warm, dry skin may occur. Temperature abnormalities include hypothermia followed by elevated body temperatures. Hepatic dysfunction, visceral hemorrhage, and renal dysfunction are uncommon manifestations of glutethimide intoxication. Factors associated with poor outcome during glutethimide intoxication include age > 60 years, high – grade coma, large glutethimide ingestion ( > 10 g), plasma glutethimide level exceeding 30 mg/L, and concomitant ingestion of other CNS depressants. Stabilization. Similar to other sedatives- hypnotic overdoses, stabilization requires careful evaluation of the level of consciousness and oxygenation. Seizures may occur during withdrawal from glutethimide along with restlessness, agitation, and delirium. All patients with altered levels of consciousness should be evaluated rapidly for hypoglycemia and hypoxia. Fluctuating levels of consciousness may result in initial improvement followed by serious deterioration of vital signs. Gut Decontamination. The administration of activated charcoal is appropriate for patients with glutethimide overdose presenting< 1 – 2 hours after ingestion. However, patients who present to a health care facility > 1 – 2 hours after glutethimide ingestion frequently require no gut contamination measures as a result of the lack of clinical data to support the use of aggressive decontamination measures. Theoretically, the administration of activated charcoal more than 1 – 2 hours after ingestion can decrease glutethimide absorption in comatose patients with decreased GI motility, but there are inadequate data to indicate that the administration of activated charcoal at this time improves clinical outcome. Gastric lavage in comatose patients is a therapeutic option, particularly when delayed gastric emptying and the formation of drug concretions are suspected. However, there are few data on the efﬁcacy of gastric lavage in glutethimide overdose. Syrup of ipecac is not recommended because of the potential for aspiration and the lack of efﬁcacy. Fluctuating vital signs or level of consciousness suggests the presence of continued glutethimide absorption from drug concretions and, therefore, the need for endoscopy. Elimination enhancement. There are limited data on the effect of hemoperfusion and hemodialysis on the clinical outcome of severe glutethimide intoxication. Although both resin hemoperfusion and hemodialysis increase glutethimide clearance about 300 mL/min and 30 – 110 mL/min, respectively, the large tissue stores of glutethimide limit the total amount of drug removed. Reported in vitro dialysance of glutethimide at renal ﬂow rates of 200 mL/min was 80 mL/ min. Consequently, the exact role of hemodialysis and hemoperfusion remains unclear; most patients require only supportive care. If used, hemodialysis or hemoperfusion should be limited to potentially severe intoxications. Forced diuresis is contraindicated because of the propensity to produce pulmonary edema. There is no antidote for glutethimide poisoning. The drug reduces the effectiveness of warfarin, a medicine that ﬁghts heart attack and stroke by reducing blood clotting. Glutethimide is also supposed to be avoided if someone is taking the anti-blood-clotting substance coumarin. A U.S. Army aerospace test found that using alcohol with glutethimide did not harm breathing. That ﬁnding has rather narrow signiﬁcance for most persons, but a more generally relevant ﬁnding came from an experiment showing that glutethimide raised blood alcohol levels of persons who had been drinking. Alcohol and glutethimide may be a mix to avoid. Antihistamines should be used cautiously with glutethimide. Animal experimentation shows that injection of marijuana’s main active component THC (tetrahydrocannabinol) increases the potency of glutethimide, thereby increasing the risk of overdose. Does glutethimide show up on drug tests? If used alone, standard drug tests can’t detect glutethimide.